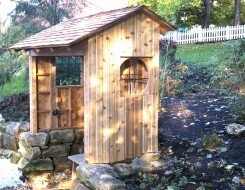 This Bar Harbor garden shed plan was built as part of a Japanese garden project undertaken by this ambitious customer from Pittsburgh, with its front walls removed by virtue of design. 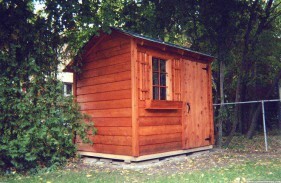 It's a fine example of the range of applications our buildings have. 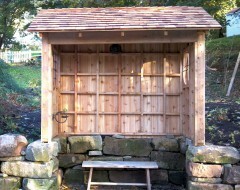 This Bar Harbor from Pittsburgh has its front walls removed by virtue of design as part of a Japanese garden project undertaken by this ambitious customer. It's a fine example of the range of applications our buildings have. 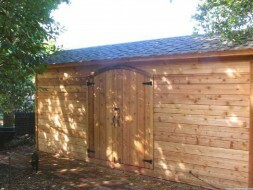 This sturdy 6ft x 8ft Bar Harbor shed seen here in Houston, Texas provides a stylish and practical storage area for anything from your tools, to yard machinery, to toddlers' toys! 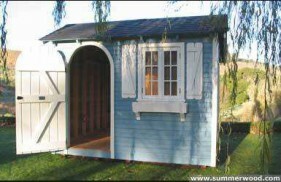 A saltbox style roof and solid Dutch door keeps the elements at bay! 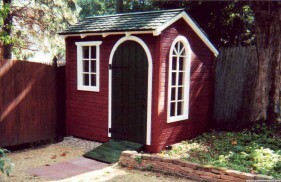 Garden tools, yard machinery, toddlers' toys will find a port in any storm with our sturdy 6ft x 8ft Bar Harbor shed seen here in Houston, Texas. 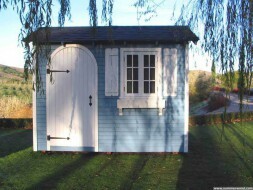 A saltbox style roof and solid Dutch door keeps the elements at bay! 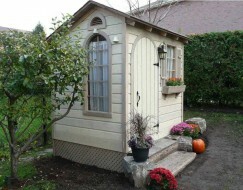 This customer in Toronto, Ontario, adds a new dimension to this 6ft x 8ft Bar Harbor utility-storage shed, adding an arch window and storm shutters. 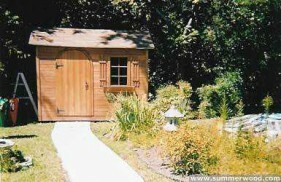 With dozens of add ons to choose from, the perfect backyard shed is at arms reach for any distinct style! 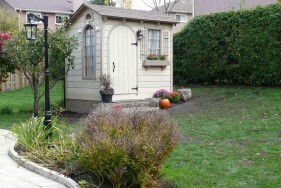 An 8 pane arch window and arch storm shutters round the side add a new dimension to this 6ft x 8ft utility-storage shed in Toronto, Ontario; what a beauty! Choose your choice of options which can elevate any style. 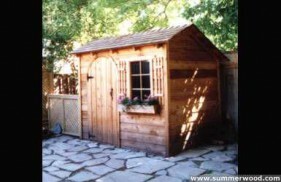 This rustic backyard studio is certain to appeal to the nature lover. 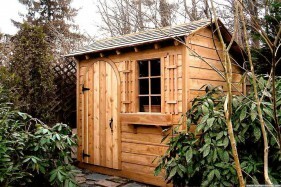 With a natural, rough cedar finish, an arched door, and classic window, this 6x8 Bar Harbor shed plan is down to earth, and a beautiful addition to this California backyard! Here's a design certain to appeal to the nature lover. 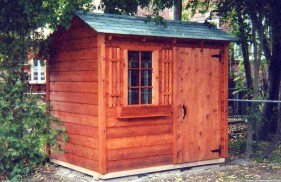 Finished in rough cedar with an arched door and standard window this Bar Harbor is down to earth. 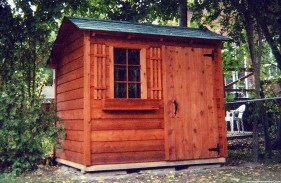 Our 6ft x 8ft Bar Harbor garden shed is home to Amityville, New York which comes with cedar siding and is tucked beautifully in a lush environment. 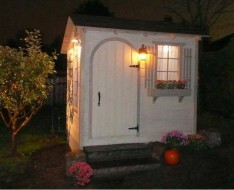 Features an arched door that's ideal for easy access. 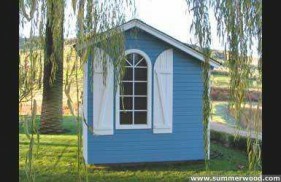 This cozy Bar Harbor Shed kit is located at Poughkeepsie, New York, it is 6ft x 8ft and it features rough Cedar siding, arch doors and arch windows. 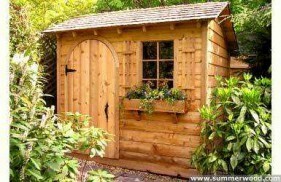 Imagine having this perfect storage space at your own home. 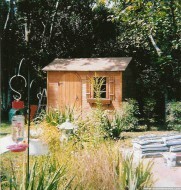 Note the back slanting saltbox roof, a distinguishing feature on our Bar Harbor garden sheds. 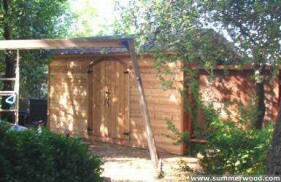 It lets you use spaces beneath branches, awnings and other overhangs. 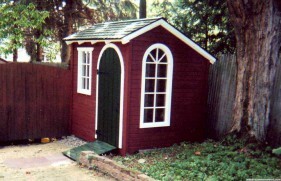 With its long sloping back, the saltbox roof of this Bar Harbor garden shed extends the structure much farther than the short front would suggest. 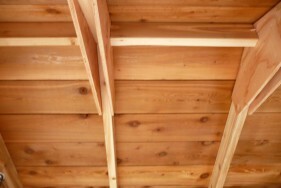 The Bar Harbor's roof design is unique, giving it that "English Countryside" feel. 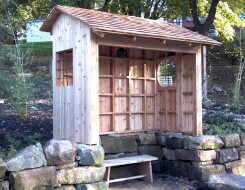 Natural cedar siding adds to its beauty. 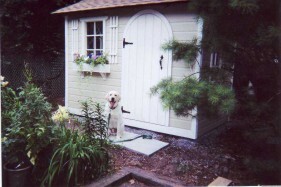 This dog house - err - garden shed has gone to the dogs! 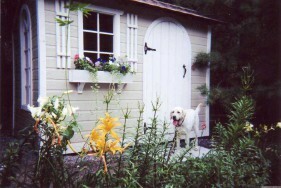 This pooch looks like he's loving the new addition to his home - and who else wouldn't! 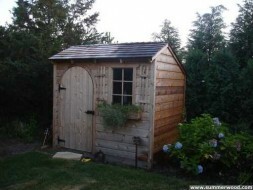 These customers from Toronto, ON replaced their old, worn-down shed with this very sharp looking compact 6ft x 8ft Bar Harbor garden/potting shed. 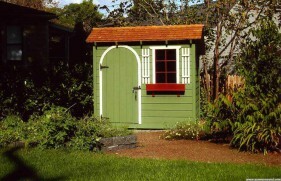 This unit features a staggered roofline that isn't overbearing or overly tall. 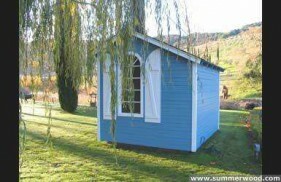 At 7ft x 14ft, this Bar Harbour garden shed in California packs a lot of storage space; partitioned smartly inside, it's a packrat's dream come true. Efficient and elegant, wouldn't you agree?